The RB-SC2 Dual Sample Rate Converter. The RB-SC2 sample rate converter is a 1U rack-mount which produces AES/EBU, S/PDIF and TOSlink optical level digital audio outputs from a balanced AES/EBU, S/PDIF and TOSlink optical level digital audio inputs. The sample rate of the outputs can be set by an internal clock or from various external synchroniser sources. It has 2 independent sample rate converter circuits that use a common clock source to set the output sample rate. It has 2 optional video synchronising boards. These set the output sample rate to 48kHz that is synchronised to either an analogue video signal or SDI digital video signal (HD or SD). A special X-Lock mode allows the unit to function as a full bi-directional sample rate converter. It has TOSlink optical digital audio inputs and outputs. A serial RS232 port is included so that the RB-SC2 settings can be controlled remotely. The front panel LED indicators alter automatically when using RS232 commands. For the digital outputs, there are three push-button switches to select the sample frequency (FREQUENCY), channel status bit type (CSDATA), and sync source and mode of operation (SYNC). Mode (CON) or to follow the mode of the input (FOLLOW). 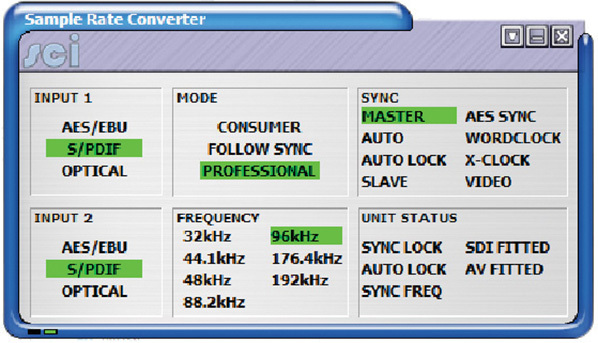 The SYNC button is used to select the synchronisation input, from the AES/EBU sync input, the Wordclock input or, for X-Lock, the other digital input. The X-Lock synchronisation allows the unit to act as a bi-directional sample rate converter with the output of sample rate converter 1 syncing the input of sample rate converter 2 and vice versa so that they follow each other. The application for the X-Lock mode is so that the RB-SC2 can be inserted between 2 digital devices which run at different sample rates, such as a PC recorder and a digital player. Using the RB-SC2 in X-Lock mode ensures that the 2 devices remain synchronised at all times regardless of the sample rate of the 2 devices. The SYNC button will also select the operating mode of the unit as described below. If an optional video sync board is fitted then 2 sync LEDs light together to show the active video sync. In this mode the unit receives a digital audio signal, which is passed to the sample rate converter and then re-formatted for the digital serial transmitter (IEC958). 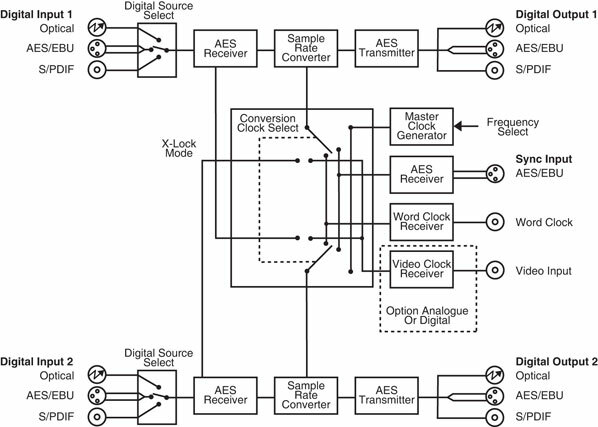 The sample rate converter clock signal is generated internally from an on board master clock at a selectable rate (32kHz, 44.1kHz, 48kHz, 88.2kHz, 96kHz, 176.4kHz or 192kHz). In this mode the unit is synchronised to an external source, using the digital audio sync, or to the TTL level Word Clock. The FREQUENCY LED will indicate the synchronised sample frequency and if no sync is present, no output will be generated. Here, the unit is synchronised to an external source, using the digital audio sync, or to the TTL level Word Clock. If no sync signal is present the unit runs from the onboard master clock at a rate selected by the front panel control (32kHz, 44.1kHz, 48kHz, 88.2kHz, 96kHz, 176.4kHz or 192kHz). When operating in sync modes, the SYNC button flashes whenever the unit is not synchronised to the incoming sync signal. There are 2 further push-button switches (INPUT 1 & INPUT2) that are used to select the input connector used for each of the 2 sample rate converter circuits. These switches select between AES/EBU, S/PDIF and TOSLink optical connectors. A red LED indicates when power to the RB-SC2 is on. Dynamic Range: 138dB typical A-Weighted. Input Sample Width: Up to and including 24 Bits. Output Sample Width: 24 Bits. SMPTE-259-M-C (SD) and SMPTE-292M (HD). The Analogue video sync board will accept a composite signal of NTSC (525), PAL (625) & SECAM (625) signals covered by SMPTE-170-M (NTSC) and ITU-R BT.470-6 (PAL & SECAM).